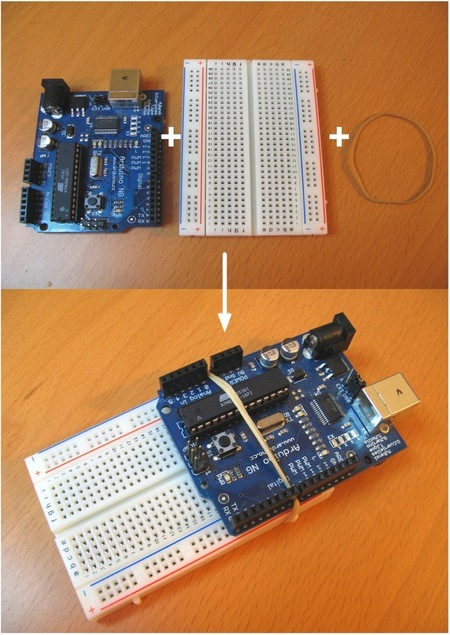 The various prototyping shields available for Arduino are a great, sturdy way to add a breadboard. 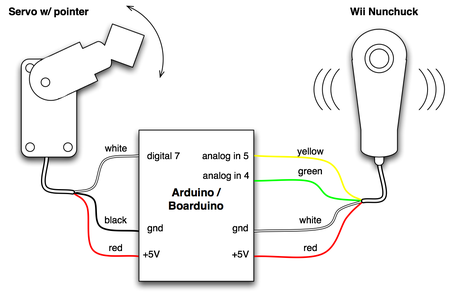 The Boarduino is another nice way to securely attach an Arduino-like device to a breadboard. But if you already have an Arduino and a solderless breadboard, you can attach the two together with an amazing bit of open source technology called a rubber band. You can get these small solderless breadboards from either Adafruit.com or All Electronics. They’re about $5. Run a few power and ground lines and you have a nice little prototyping infrastructure. 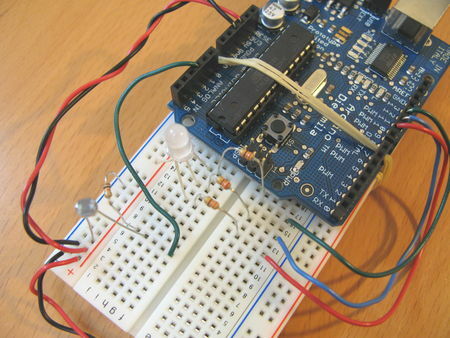 And then you can start doing some real circuits. I can’t take credit for this innovation. As I was poking through the class notes for the Berkeley Tangible User Interfaces class, I noticed they use this method. Those bent paperclips are a great idea! Instead of rubber bands, I use some cut and bent paper clips that go through the bolt holes on the PCB and into the holes of my breadboard (I have a large board approx. 2.5x the size of the Arduino Duemilanove), so my Ard. is securely mounted and I have loads of prototyping room. Hm, open source _rubber band_, eh? Care to share a source and price tag for these critters? SCNR. Wow! 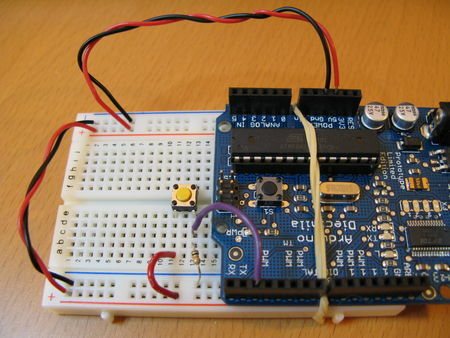 I’ve had my Arduino rubber-banded onto my bread board since I got it several months ago. I was jealous of all the mini-breadboard shield owners. Thank you for validating me! Great PDF Arduino Notebook BTW! Hi Chutzpah, I use Omnigraffle. Why didn’t I think of that?!?!? …and I thought I was being a low-tech cheapskate using sticky-back Velcro. I knew I should have patented this! I actually had items in my cart from your previous prototyping board design and then I was like….why am I paying for something I can do myself for free?